Employee State Insurance Registration Simplified! E.S.I.C. latest update: E.S.I.C. contribution rates are reduced W.E.F. 15th February 2019! Employees’ State Insurance Corporation (“ESIC”) is a statutory corporate body set up under the ESI Act 1948, which is responsible for the administration of ESI Scheme. The ESI scheme is a self-financed comprehensive social security scheme devised to protect the employees covered under the scheme against financial distress arising out of events of sickness, disablement or death due to employment injuries. The ESIC has its headquarters at New Delhi besides 23 regional offices, 26 sub-regional offices in the states and over 800 local offices throughout the country to support the implementation of ESI scheme. In addition, the Medical Benefit Council, a specialized body that advises the ESIC on the administration of Medical benefit is functioning. 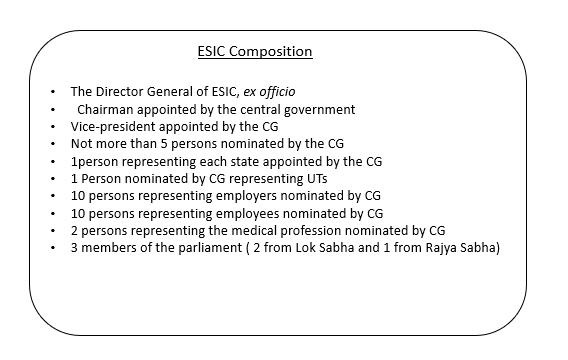 The ESIC generally consists of the following members as explained below. The ESI scheme is applicable to all factories and other establishments as defined in the Act with 10 or more persons employed in such establishment and the beneficiaries’ monthly wage does not exceed Rs 21,000 are covered under the scheme. Whether the employer has employed 10 or more employees, all employees employed by the employer, agnostic of the salary are reckoned. The scheme under the act also supports restaurants, motor road transports, newspaper establishments and undertakings, movies and purview theatres, hotels, shops. The threshold for coverage of establishment is 20 employees in Maharastra and Chandigarh. Complete medical care and attention are provided by the scheme to the employee registered under the ESI Act, 1948 at the time of his incapacity, restoration of his health and working capacity. During absenteeism from work due to illness, maternity or factories accidents which result in loss of wages complete financial assistance is provided to the employees to compensate for the wage loss. The scheme provides medical care to family members also. As on 31 March 2017, 2.93 crore employees are covered under this scheme with the total number of beneficiaries summing up to 12.40 crores. Broadly, the benefits under this scheme are categorized under two categories, 1) cash benefits (which includes sickness, maternity, disablement (temporary and permanent), funeral expenses, rehabilitation allowance, vocational rehabilitation and medical bonus) and, 2) non-cash benefits through medical care. The scheme is self-financing and being contributory in nature. The funds under the ESI scheme are primarily built out of the contribution from the employees and employers payable monthly at a fixed percentage of wages paid. Currently, the employee contribution rate is 1.00% of the wages and that of employers is 4.00% of the wages paid. For newly implemented areas, the contribution rate is 1% and 3% respectively for employee and employer for the first 24 months. The employer makes the contribution form its own share in favor of those employees whose daily average wage is Rs 137 as these employees are exempted from own contribution The employer is required to pay his contribution and deduct employees’ contribution from wages and deposit the same with ESIC within 15 days from the last day of the calendar month in which the contribution fall due. The payment can either be done online or through designated and authorized public sector banks.